Robert Greubel and Stephen Forsey have shown creative daring and boldness in uniting their second Fundamental Invention, the Quadruple Tourbillon, with their ground breaking interpretation of the GMT with its outsized rotating globe. Displaying three timezones along with a universal time function, this exceptional timepiece is distinguished by its 3D architecture created with extreme attention to fine craftsmanship. the more precise the timekeeping will be, Robert Greubel and Stephen Forsey invented the Quadruple Tourbillon with a spherical differential. Right from the original idea the concept was clear. 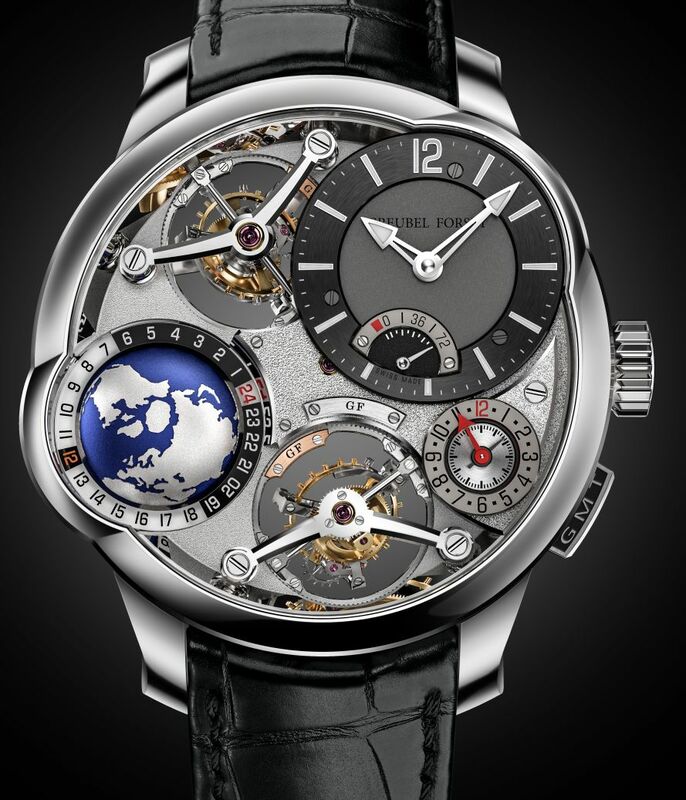 While coupling four separate tourbillons would have been challenging, they sought a more compact solution. To save space in all three dimensions, they chose to construct the tourbillons in pairs within a unique system of compact cages, an extremely challenging feat. Each of these two systems is modelled on the Double Tourbillon 30°, with a first cage rotating in one minute and angled at 30°, fitted inside a second upright cage performing a full rotation in four minutes. 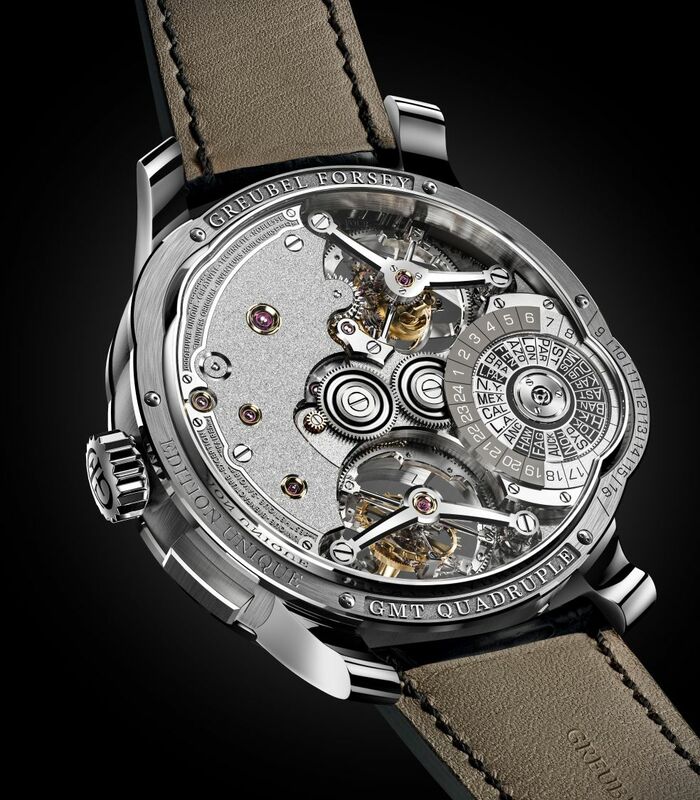 The combination of the inclination of the inner cage and the different rotational speeds of the two cages focuses on cancelling out the timing variations due to the earth's gravitational attraction in all the usual positions a wristwatch can adopt, particularly in stable positions. The spherical differential serves to average the timing of the two autonomous oscillators and thus improve chronometric performance, a system for which two patents have been filed. timepiece aptly named the GMT, more recently joined by the GMT Earth. In this patented system, the second time zone indication on a separate subdial is paired with a universal time display providing an intuitive reading of the time around the world thanks to a world first: an outsized globe completing one full rotation every 24 hours, following planet Earth itself. observers can admire the spectacular sight of the Earth in motion, surrounded by a fixed 24 hours ring around the Equator and displaying local time for all the longitudes simultaneously taking account of the day/night indicator (on respectively light/dark zones). A lateral window in the asymmetrical section of the case provides an unprecedented view of the Equator and the Southern hemisphere. The four tourbillons gravitate in two pairs on either side of the blue planet, each featuring an open and transparent construction, secured by flat black polished bridges and adorned with gold chatons as well as hand-polished bevelling and countersinks. A truly enchanting and exquisitely light choreography. The case, in 18kt white gold, with asymmetrical convex sapphire crystal, measures 46.5mm x 17.4mm. Transparent back with asymmetrical convex sapphire crystal. Lateral window with shaped sapphire crystal. 3D variable geometry-shaped lugs. 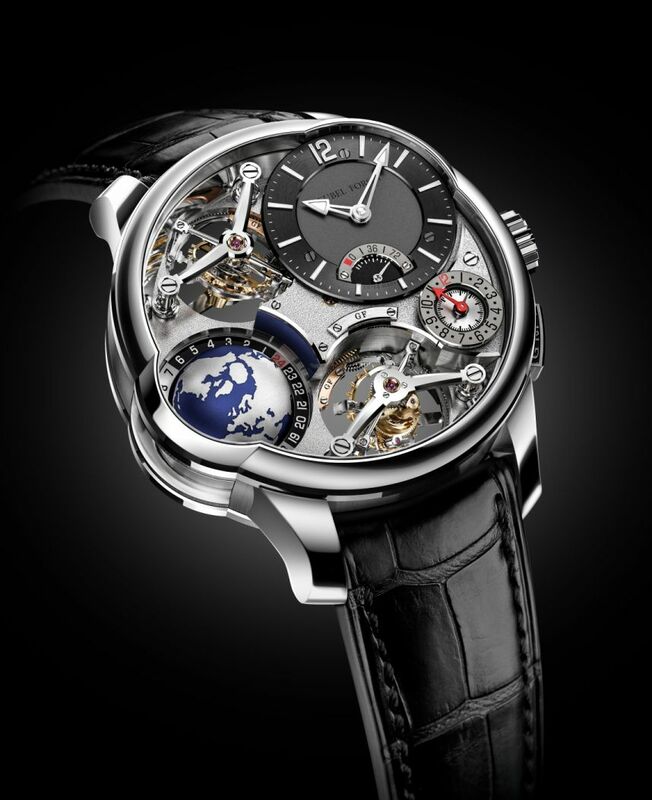 Raised polished engraving "GMT Quadruple" and "Greubel Forsey" on a hand-punched background. Gold security screws. Polished bezel, caseband with hand-finished straight graining. White gold GMT pusher with raised engraving on a hand-punched background. It is water resistant to 30 meters. Movement is the Swiss hand-wind Greubel Forsey in-house caliber with 84 jewels, 21,600 vph and a power reserve of 3 days. 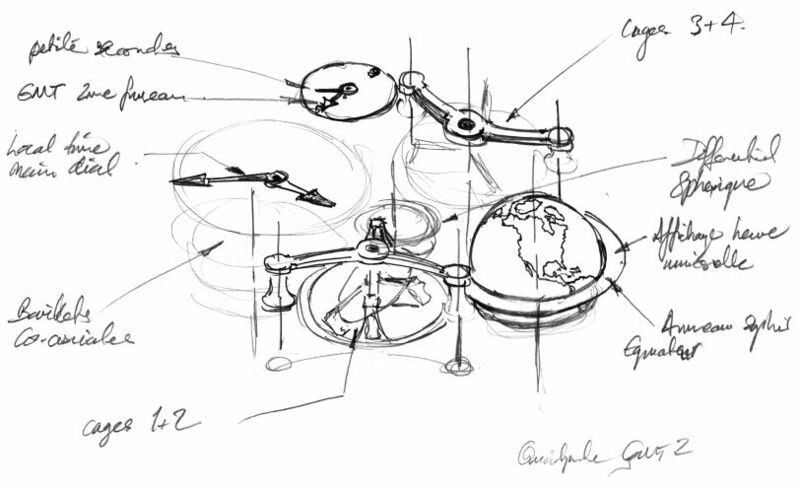 The movement is comprised of 705 parts, with the four tourbillon cages comprising 260 parts, and weighing 2.25 grams. Olived-domed jewels in gold chatons. Chronometric power reserve. It has three series-coupled fast-rotating barrels (1 turn in 3.2 hours), one of which is equipped with a slipping spring to avoid excess tension. Variable-inertia balance wheel with white gold mean-time screws. Phillips terminal curve, Geneva-style stud. Main plate: Nickel silver, frosted and spotted with polished bevelling and countersinks, straight-grained flanks, and nickel-palladium treatment. Bridges: Nickel silver, frosted and spotted, polished bevelling and countersinks, straight-grained flanks, and nickel-palladium treatment. Flat black polished gold plates with relief-engraved text, polished bevelling and countersinks, straight-grained flanks. Four flat black polished steel tourbillon bridges, hand-polished bevelling and countersinks, straight-grained flanks. 24 timezones universal time on a rotating titanium globe with universal time. Cities observing summer time, and day-and-night. It has a multi-level dial in gold, anthracite color with gold hour-ring, circular-grained with polished bevelling, black treatment. Gold hour markers. Power-reserve and GMT in gold, hand matte lapped. Small seconds, circular-grained. Hours and minutes hands in polished gold, with SuperLuminova. Small seconds in polished steel, black treatment. Power-reserve in polished steel, hand-polished countersink. Red second timezone GMT indicator. It comes on a black hand-sewn alligator leather strap with an 18kt white gold folding clasp, hand-engraved with the GF logo.